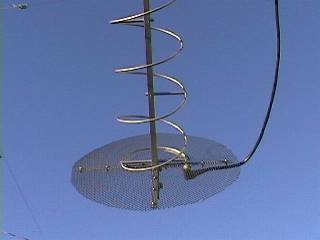 This 50-ohm impedance antenna, when fed with 25-100W of SSB RF at 435MHz, makes reaching Amateur satellites such as AO-40 and AO-10 a snap! 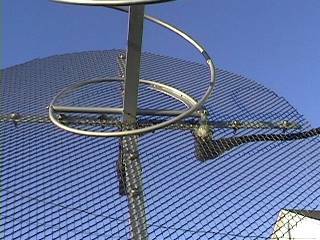 The gain of this antenna is estimated at 13dBi. This section is presented to give you ideas on how to achieve a sound mechanical construction, instead of giving you an exact recipe to follow. Stainless Steel: All the hardware, no exception! The boom is drilled through at every 1.5 turn to fit the fiberglass spacers. The spacers are drilled through and carved to support the copper tubing at one extremity. They are also drilled so that they can be fasten to the boom at the other extremity. 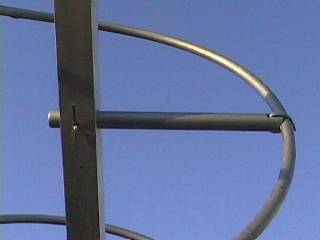 Stainless steel cotter pins are used to fasten the fiberglass spacers to the boom. The cotter pins are inserted through small holes made in the boom and in the spacers. I painted all copper and fiberblass surfaces with polyurethane-silicone alkyd paint. 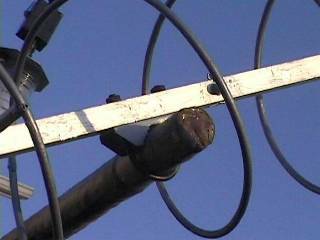 The coax cable used at antenna: 6 feet of Belden 9913, connecting 45 feet of best quality coaxial cable. The connector used: N-Female, panel mount type, housing soldered directly to reflector mesh, center pin soldered to helix wire. 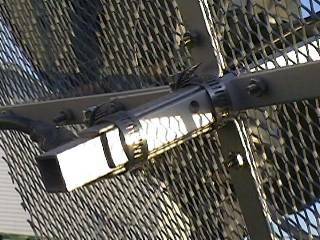 The reflector is designed so that it can be moved back and forth for SWR tweaking. Two hose clamps hold it in place when finished. 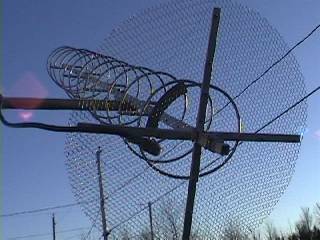 The final SWR adjustment is performed by sliding the reflector assembly. The N-connector center pin, lenghtened by a piece of AWG 12 gauge wire, is fed through a hole made in the helix tubing, but is not soldered to it. Center pin is only soldered to helix tubing when completed.